I’m very excited to share with you my first guest post! Sophia who runs Tidy London recently contacted me asking if she could write a post for The Rolling Baby and I jumped at the chance. 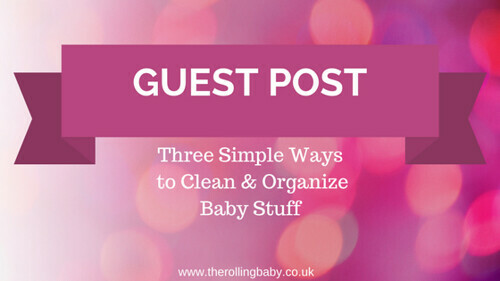 Sophia has provided some great tips for keep baby items clean and tidy and I’m sure many parents will take a lot away from her post. Making sure that your baby is always safe from any germs is very important. This is why you should clean properly all of the baby items in your house. Not to mention that a lot of baby stuff are quite expensive and storing your first child’s toys, chairs or baby stroller may be a good idea if you are planing to have a second child. I have been cleaning and organizing all of my baby’s stuff relying on those methods and I was able to use some of the items for my second child. I hope these tips can be of use for you, too. This is probably one of the most important things you have to pay attention to. You can wash the feeding bottle you use for your baby in the dishwasher. The first thing you have to do is to separate the parts of the feeding bottle. That means that you need to remove the cap, the ring and the membrane if there is any on the bottle. Rinse all the parts under a running water. It doesn’t matter if the water is cold. The next step is to load all the parts in the dishwasher and wash with a hot water and if it is possible set a sanitizing cycle. When you unload the parts off the dishwasher leave them on a clean cloth or a paper towel and let them air dry. Not only you can use it for much longer but you can also use it for your second baby if you take proper care of your baby’s stroller. The first step of the cleaning is to dissemble every part of the stroller that you can. This will help you to properly clean every part you managed to separate. Use the nozzle attachment of your vacuum cleaner to get rid of all the dust that has been gathered in the edges and all over the fabric. Then use a cloth dampened with a warm water and wipe the chassis of the stroller and use a dry towel to dry it afterwards. If there are any tough stains, you can use a stain remover and follow the instructions on how to use it. When you are done with the whole cleaning and sanitizing of the stroller you can store it in a cool and dry place so that you can use it again in the future. As tiny they can be, baby clothes are actually pretty hard to be organized. Before I tried this trick I always had hard time to find the matching bottom for my child’s outfits, so I tried using the ornament boxes in my dresser. The little boxes can fit perfectly the bottom and upper part of every outfit and you can easily match them when you dress your child. Another good item for storing your babies’ clothes it to use a hanging shoe organizer. It can easily fit a lot of your baby’s outfits and you can hang it on the door of your child’s bedroom and this way you can maximize the space in the room and still be well-organized with your baby’s clothing items. I always use these tips for cleaning and organizing and this way I am always sure that my kids are happy and I am taking good care for them. 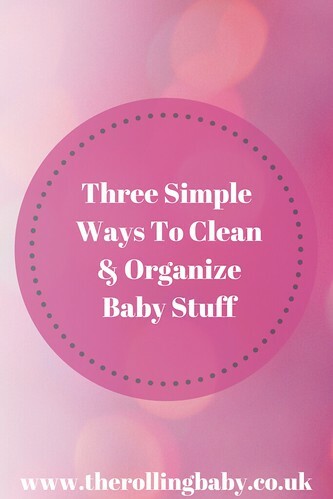 If you follow those methods when you clean you baby’s stuff and store their clothes, I promise you that you will feel at ease because you will know that you baby lives in a safe environment. Thank you very much for the fab post, Sophia! Is it too easy to get hold of Antibiotics?